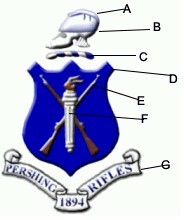 The colors of the National Society of Pershing Rifles are Blue and White. These colors have traditional national significance and each represent the cornerstones of the Society and its members. A. CHAMELEON: The Chameleon represent Pershing Riflemen’s adaptability to change and constant preparedness. After Pershing Rifles became a tri-service fraternal organization in the late 1940s the Chameleon came to represent the tri-service nature of the organization. B. HELMET: The Helmet is the symbol of the chivalry of the medieval knights. This spirit is the cornerstone of the character of every Pershing Rifles member. It is a prime requisite for conduct, a necessary part of every true heart. It symbolizes both the courage of the membership of the Society and the Society’s protection of its members. C. TORSE: The Torse, a six-divisional rope just below the Helmet, denotes the romantic aspect of the heraldry and is the symbol of the chivalrous attitude for the men for womanhood. It is representative of the Pershing Rifles Cord. D. SHIELD: The Shield, which bears the Crossed Rifles and Torch, is the symbol of the readiness of the Rifleman to meet any situation anywhere, on the battlefield or wherever we may be called. E. CROSSED RIFLES: The Crossed Rifles, crossed saltier-wise on the escutcheon of Pershing Rifles form a chevron, which has been noted as an emblem of service and of helping one another, here representing the spirit of friendship and the cooperative efforts of units in the Society in serving on another. The Crossed Rifles can also be seen as a symbol for power and military strength for the insurance of peace. F. TORCH: The Torch, flamed and superimposed over the Crossed Rifles, represents four values inherent to the Society. First, in its entirety, the torch stands for indomitable leadership embodying both the dutiful following of instructions, like true soldiers, and the intelligence issuance of command. It stands also for the eternal flame of true friendship, a fundamental quality inherent within the Society. The Torch also denotes scholarship and knowledge. To meet the demands of leadership, we must have knowledge. It does not mean just the “minimum effort” of scholarship. G. SCROLL: The Scroll bears the name of our organization and the year of its founding, 1894. The Pershing Rifles Captain officer rank shield. 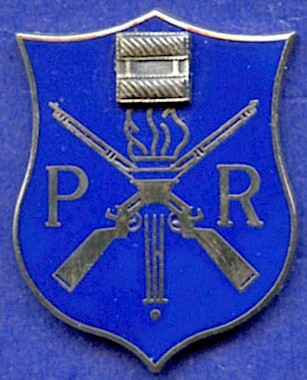 Pershing Rifles officer rank shields have been worn at least since the 1930s and are blue in color, trimmed in silver, and almost identical in nature to the shield found in the Pershing Rifles crest. Officer rank shields include a torch and crossed rifles in silver. The rank of the officer within the Society is denoted at the top center of the shield, above the torch and crossed rifles. There are rank shields for all officer ranks from Second Lieutenant to Lieutenant General. Pershing Rifles Warrant Officer Two rank shields. The Army shield is on the left and the Navy/Air Force shield is on the right. 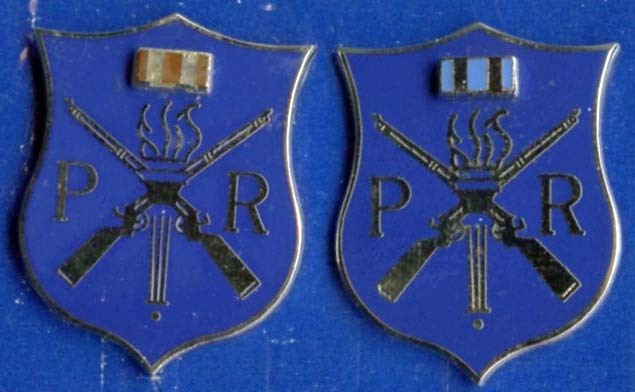 Pershing Rifles Warrant Officer rank shields come in two grades. The Warrant Officer One rank is an officer’s shield without insignia and the Chief Warrant Officer Two is a horizontal brown (Army) or blue (Navy/Air Force) bar on which is displayed two vertical silver bars representing the rank. It is believed that there are only two P/R Warrant Officer ranks because in the early 1950s when this insignia was first introduced there were only two grades of warrant officer. It wasn’t until 1956 that the armed forces adopted four warrant officer grades. 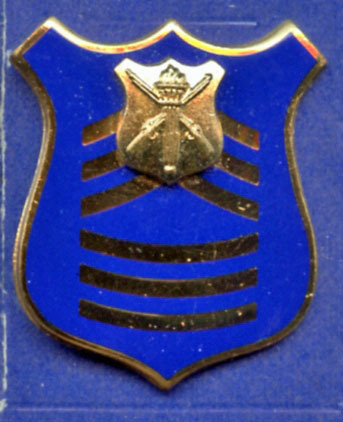 The Enlisted Rank Shields are also blue in color, but trimmed with gold. A small gold version of the Shield found in the Pershing Rifles crest rests above the chevrons. These rank shields were authorized by the US Army Institute of Heraldry in May 1969 to replace the cloth enlisted rank shields that had been worn since the 1950s on the lower right sleeve. The metal enlisted shields may have been worn unofficially several years before they were authorized. The Enlisted Rank Shields have service specific devices denoting rank of Army, Navy and Air Force Pershing Riflemen which recognizes our tri-service affiliation. However it is important to note that a Rifleman steps out of his or her service in interest of the Brotherhood. It is for this reason that the Shield, Torch, and Crossed Rifles are the basis for both the Officer and Enlisted Rank Shields. We are proud to be tri-service in nature and recognize that our ability to work together now will increase our effectiveness on the battlefields of the future. The US Army Institute of Heraldry authorized the wear of the P/R Officer’s Shields in March 1951 and the Enlisted Shields in May 1969. Air Force Instruction 36-2903, AFROTC Supplement allows for the wear of the P/R Rank Shields on the male and female uniform. On the left is the earlier blue and white P/R Membership Cord worn from the 1920s to the late 1950s. On the right is the thicker purple and white Cord that has been worn since at least the early 1960s. The Pershing Rifles Shoulder Cord is a symbol of honor bestowed to the Pershing Rifles member upon initiation and is to be worn on the left shoulder. The Cord is purple and white with the tip bearing the Pershing Rifles Crest. First worn by Pershing Riflemen at the University of Nebraska as early as 1924, The original colors of the cord were blue and white – the colors of the Society. This style of modern fourragère originated with the French Army which fought alongside Pershing’s American Expeditionary Force in World War I. The French awarded a fourragère to units that distinguished themselves in combat. So it is fitting that the fourragère is a sign of distinction that represents membership in the National Society of Pershing Rifles. The membership cord remained blue and white until at least the late 1950s. Sometime in the 1960s the colors of the cord changed to purple and white. There is no documented evidence as to why this change was made. However, Pershing Rifles lore is that during World War II along with many other rationed items, blue dye was in short supply. The company that made cords substituted purple for the blue. It was thought that following the war and the end of rationing, the cords returned to blue and white for a short period of time. But in the 1960s to honor the sacrifices of the Vietnam War and World War II, the cord was to have once again returned to purple and white and has remained as such since. The official flower of the National Society of Pershing Rifles is the white rose. Traditionally, this flower represents the most important man or family of the era. White roses are also associated with honor and reverence. For the Pershing Rifleman, the white rose symbolizes the great life of our founder and patron, General of the Armies John Joseph Pershing, who made the ideals of the Pershing Rifles a reality. The thunderbolt, although used by some Pershing Riflemen, is not an official symbol of the National Society of Pershing Rifles. Where can I purchase the Shoulder Cord? The Pershing Rifles membership cords are sold by Vanguard Industries. Call them at 1-800-221-1264 or e-mail schools@vanguardmil.com and ask for the P/R Membership Cord. There are two versions, one for all services and a second specifically for the Air Force.